One of the most popular and successful exercise programs ever devised was also one of the simplest. The Royal Canadian Air Force developed a workout routine for their pilots in the 1950s and published it for the public in 1961. Called the 5BX routine (Five Basic eXercises), it consisted of nothing more than a stretch, a sit up, back extension, push up and running in place. There are five levels of the routine; the same exercises being done with increasing difficulty as one progresses. Twenty-three million copies of the pamphlet were sold to the public and it was translated into thirteen languages. Many of the pilots continued to do the routine for the rest of their lives, as did many of the civilians who bought the book. With that question answered, one can move on to the more important task of actually getting the work done. My wife, Tracy Reifkind, lost 120 lbs in one year using a very similar approach to her diet, which she called “The Luxury of No Choice diet.” She set up a very basic eating routine for herself and ate the same way each day, putting her energy into cooking and enjoying the food she chose and not into deciding what to eat. The diet was chronicled in her chapter in Tim Ferriss’s bestselling book The Four Hour Body. She has kept the weight off for almost 11 years now. Routine works. I used this same approach throughout my many athletic incarnations; from elite gymnast to competitive bodybuilder, from powerlifter to Russian Kettlebell athlete. Establish a simple-to-follow routine and stick with it. The simpler it is, the more chance one has of actually doing it regularly. I also use this method in my Body Maintenance course. Whether one is an elite athlete or a total couch potato, the body is getting tighter, stiffer, less elastic and more prone to injury unless the muscles and fascia are kept in good repair. As physical therapist Curtis Cramblett says, “the body is cement, waiting to harden; and motion is lotion”. No matter how good the lotion is, it does no good unless it is applied. It’s the same with taking care of your body. Work out really hard and you get stiff and tight . . . sit at your desk for days on end and the same thing happens. Everyone would love the luxury of a daily massage with an expert who could work out all the knots and tight spots, helping you to recover and get ready for the next workout or the next day at work. But for most of us, that’s not realistic from a time or finance perspective. Your car, your teeth and your house require regular maintenance. So does your body. That’s what led me to develop a series of very simple self-myofascial release routines (read ‘self-massage’) using common massage tools and a series of stretches designed to cut right to the chase and let you unlock yourself. Every day. As a routine. The idea is to “assess and address” your body’s aches and pains daily. By going through these simple routines on the foam roller and lacrosse ball, one can very quickly learn the effect the previous day’s work had on your body. Some parts will need no attention; some will require quite a bit. It will be different every day. 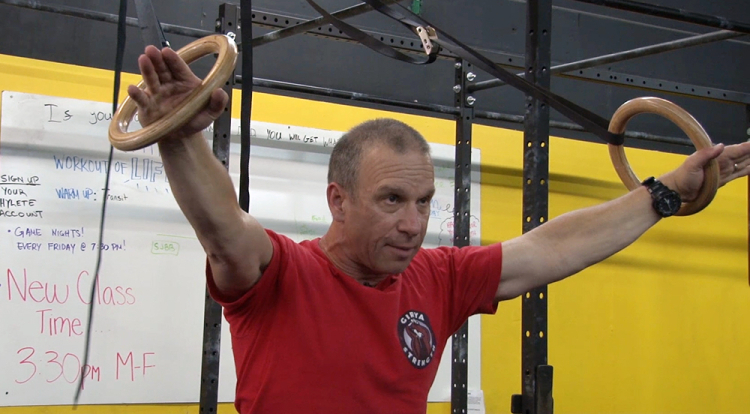 The routine is actually four sub-routines; foam roller, lacrosse ball, stretch series on the floor and overhead routine with a stick for shoulder, upper back mobility and range of motion. They can be done as a whole or individually depending on the time you have available and how your body feels. Body Maintenance is meant to be done daily, preferably in the morning to prepare you for the day. Something you can learn, do and get through very quickly; just as when you brush and floss your teeth each day. Not the most fun in the world, but a necessary evil. The good news is that the more regularly you do it, the easier it gets as you address tight and stiff tissues right away. Small issues don’t become large ones. You feel better, move better, recover faster and have less restrictions and injuries over all. You also don’t have to wait to have someone else relieve a small ache or pain that suddenly became a big issue. That, in itself, is very empowering. My Body Maintenance downloadable video and manual provide an easy to follow, step-by-step guide on how to unlock yourself and get back the spring in your step while getting rid of the ache in your back. 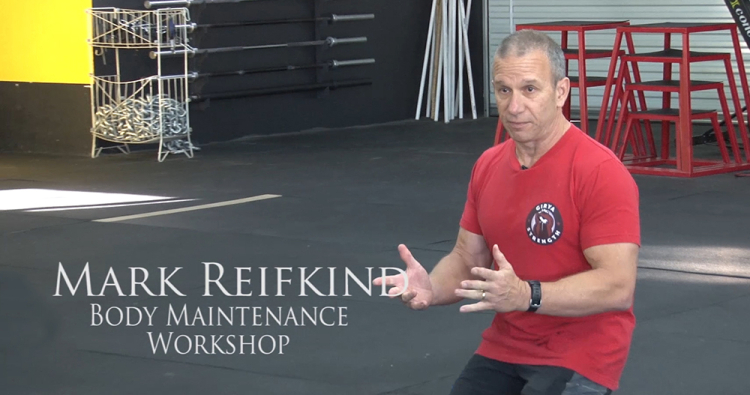 The video is a condensed version of my 8-hour workshop. The manual provides the routines, regressions, progressions, techniques, common mistakes and corrections. Everything you need to embrace the power of the routine and take charge of your body.